I know I am new so I'll give you guys a break! But why the hell would being more tolerant of non-Whites be a good thing? Shouldn't the whole aim of a White forum is to put our interests first?! Pros - big on freedom of speech,[yeah right!!!! - ed] way more tolerant of nonwhites, race mixers, crazies and oddballs allowing them to say whats on their mind - for better or for worse. And yes, I repeat, I don't like making threads like this but try to put it up to help people... Whites are too divided? Will us Whites ever get it? Even in cyberspace...? Simon, ideology is far less important to those two sites than what drives their owners. Don Black was a mercenary, fortune is his master and I believe he sold out long ago. He milks patrons and is very likely getting paid by "the movement's" enemies. He allows far too many jews to mod and post there. 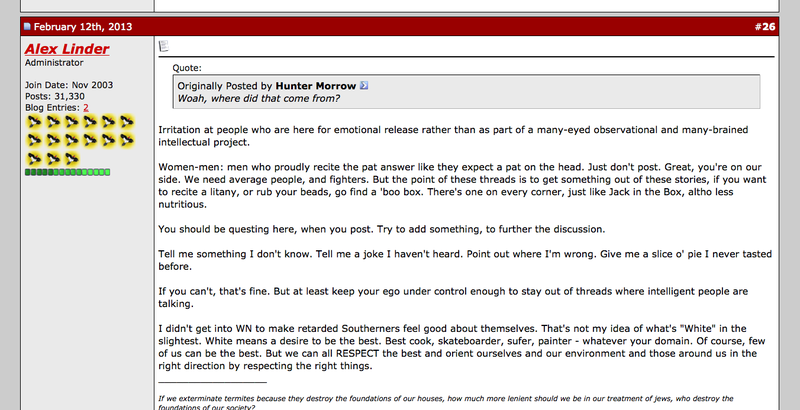 As for Linder, you can read the consensus on him in the "Other WN Sites" forums. With those opinions in mind, remember that our racial enemies want desperately to lead the opposition, like Lenin did, to destroy it. You can see how Black and Linder cause as much disunity as they can without showing their whole hand at once. Am still in corral, and not posting. . . Does seem unbelievable! A bit of humor! I heard that someone wrote on their profile "Jewnited Snakes of America" on their profile and were kicked off SF! I think it's hilarious! Thanks for your comments! I wish you the best of luck too Fred.